You’re not the only one surprised to see a named tropical storm so early. Joe Furey said the GFS model had something like this ten days ago, but it wasn’t anything I was concentrating on. 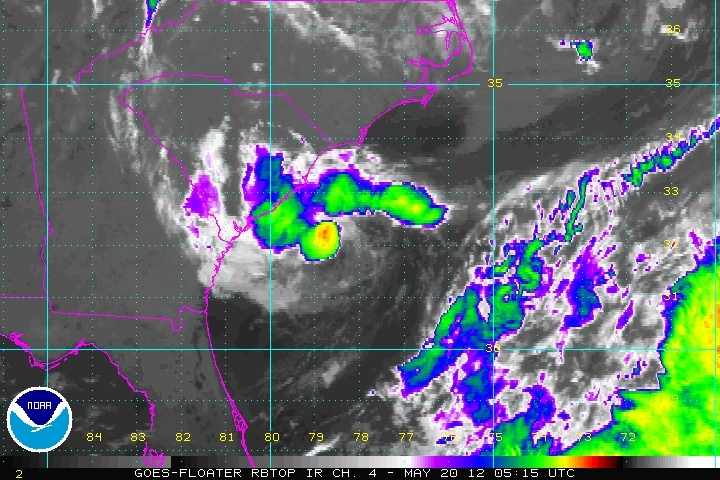 This afternoon the National Hurricane Center turned a low off South Carolina into Tropical Storm Alberto. This afternoon the National Hurricane Center turned a low off South Carolina into Tropical Storm Alberto. You’re not the only one surprised to see a named tropical storm so early. Joe Furey said the GFS model had something like this ten days ago, but it wasn’t anything I was concentrating on. The Hurricane Center’s on the case. Their latest discussion is three long paragraphs. Conclusion: we really don’t know. THE INTENSITY GUIDANCE REMAINS SPLIT WITH THE DYNAMICAL GUIDANCE SUGGESTING SOME WEAKENING…AND THE STATISTICAL TOOLS SHOWING STRENGTHENING. Weakening and strengthening! Where is Miss Cleo when you need her? The official call is 50 mph, but satellite and radar observations imply it’s weaker. I can’t imagine how it could strengthen. There’s a reason the hurricane season starts later than this. Tropical systems only exist under very specific conditions. Tonight those conditions only exist marginally and in a very small areas. By midweek Alberto should be out in the Atlantic, getting raggedy and losing its tropical characteristics. Yeah I was pretty surprised by this. But I have a question; I was on WeatherUnderground and checked their computer models. Most had Alberto weakening and turning out to sea by midweek. But two models had it coming up the coast and making a sharp LEFT turn into RI and MA. Who are those guys and how accurate are their predictions? When storms have little forward motion computer models do a terrible job. All I can say is I sure hope that this doesn’t foretell of a bad hurricane season. Tropical Storm Alfred left me without power for 5 days and made a mess I do NOT want that or anything bigger this year.Defineitly NOT a fall snow storm that was ALOT worse !!! People aren’t affected by seasons. Hurricane Andrew came in a very quiet season! Don’t be sad. That made me smile. I’m with the others. When I need extra info or clarification I turn to you.